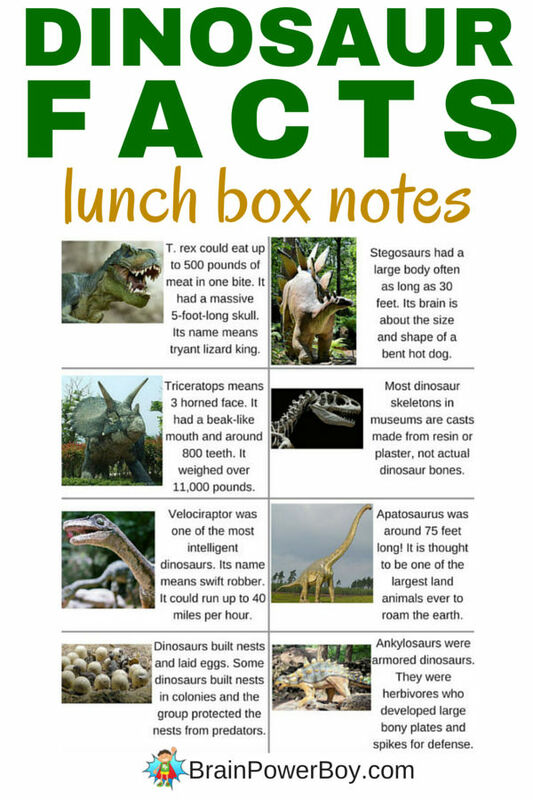 Our dinosaur facts lunch box notes are the 3rd in a series of free printable lunch box notes. Dinosaurs are a hit among the boys I know. They just love them and these fit nicely with the great dinosaur resources here on the site. Each note has a cool dino fact and a great image to go with it. I hope your kids like them! If you have a dinosaur fan use our dinosaur facts printable notes and slip them into your child’s lunch box for a fun little extra. These little facts make for great conversations. Did you know that T. rex’s skull was 5 feet long?! Hard to imagine, isn’t it? Carefully cut apart on the lines. This is my favorite way to cut straight lines. If you homeschool, place these next to your dino fan’s lunch. If your child goes to school, pop them in a lunchbox. They are a super surprise either way. Here are some fun dinosaur items the you may wish to check out. Best Books for Boys: Dinosaur Questions and Answers. Oh great Erin! I’m so glad to hear it. I hope he enjoys them.